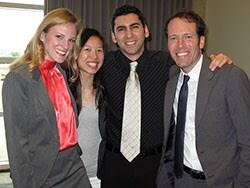 It is April 9, 2010, and UCSF student pharmacists (pictured above left-to-right) Meghan Frear, Wen Chiu, Maher Abdel-Sattar, and Doug Beeman are among a room full of pharmacy students from across the US at the Academy of Managed Care Pharmacy's (AMCP) Annual Meeting in San Diego, California. 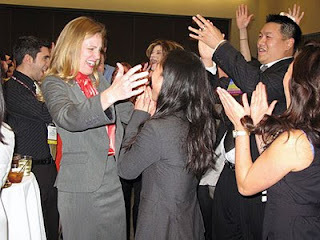 They have just learned they won AMCP's national 2010 Pharmacy and Therapeutics Competition. They later discussed their success and the process leading up to it in this interview with Susan Levings, UCSF School of Pharmacy Associate Dean of Planning and Communications. What is the P&T competition all about? The pharmacy and therapeutics competition is sponsored by the Academy of Managed Care Pharmacy.The purpose of the competition is to give pharmacy students a chance to experience the P&T formulary decision process and practice evidence-based decision making. The competition begins locally. For us, the process started here at UCSF. All pharmacy students are invited to participate regardless of their year in school. Each participant picks a partner with whom to collaborate, and each couple is randomly matched with another couple to form a team of 4. Each team reviews a medication dossier it's been given and researches the specifics of the disease state in question, writes a drug monograph, answers a series of essay questions relating to the disease state and value of the drug or drugs, and prepares a 30-minute oral presentation of the case. The case is different every year and usually presents a challenging scenario in which students need to decide whether to include one or more drugs on the formulary of a specific insurance coverage plan. Such a decision depends on multiple considerations including the credibility of the safety and efficacy data for each drug, the soundness of the economic and budget-impact studies done by the manufacturer, the disease treatment alternatives and guidelines, the criteria for treatment, the demographics of the population covered in the insurance plan, and other factors. In the local UCSF competition, UCSF staff judges identify the UCSF team with the best written and oral presentations to be submitted to the AMCP P&T national competition committee. The top 8 teams nationally are given a stipend and invited to attend the AMCP annual meeting and showcase where they compete for the championship title. The winning team earns a scholarship of $2,500 for its school in addition to considerable recognition for its achievement. What was the process of getting to the top? Getting to the top of the competition is a 6-month process.The case we were working on was distributed in November, and throughout the winter break and in early January we prepared for the local competition.Again, the written materials from the team winning the local competition are then submitted to the national competition. This year 21 teams submitted to nationals.Finally in March, the top 8 teams were revealed and invited to present at the national conference. Presentations took place over a two-day period, and the top 3 teams were announced later on the second day. The process itself might seem simple--two rounds of competition with a lot of time in between--but the amount of preparation and practice that goes on before a team starts to compete and after a team moves on to the national level is intense. What was the exact case you addressed? The case is the same at every level of competition.This year it was a therapeutic class review of TPO Receptor Agonists and their use in the bleeding disorder trombocytopenic purpura.The specific drugs were eltrombopag (Promacta®) and romiplostim (NPlate®). This case was challenging on multiple levels.There are only two drugs in this class, and they were both FDA approved in the last two years, making it difficult because of the lack of long-term safety and efficacy data and treatment experiences in real patients. Then there was the challenge of the disease state itself. Idiopathic thrombocytopenia purpura has an extremely low prevalence and the etiology and the exact pathophysiology is not completely understood.Additionally, standard treatment involves a range of therapies that are all used off label without clinical trials to back up their use. This case was particularly relevant to one of us on the team whose parent suffers from the disease.This made it both more interesting and more difficult to do the research and make a decision about putting the drugs on the formulary or not.Our teammate shared his experience of living in a family impacted by the disease for more than 13 years, trying multiple therapies and even surgery--both of which were unsuccessful. You would think that our first response would be to immediately put the drugs on the formulary. But after learning of the side effects, the costs, and the safety profile we opted to immediately add only one of the drugs to the formulary--with the intention of reviewing that decision in one year's time pending more data for both drugs. In the end, the personal experience of our teammate strengthened our overall perspective and ability to relate to patients, while maintaining our objectivity about the data we used to make our decision. What did you do to prepare before you left for San Diego and while you are there? Because we were the local team headed for the nationals, we were able to present our case one more time in front of UCSF alumni and Dean Mary Anne Koda-Kimble. This served as a wonderful opportunity for us to get in even more practice answering very challenging questions. Before flying to San Diego, we rehearsed the presentation one last time, and we met again at the hotel the night before the competition. Since the UCSF team was one of the first to present its case this year, we didn't prepare much in San Diego, but we felt very confident and we were as ready as we could be. On the morning of the competition, there's a hosted breakfast to allow the different P&T teams to meet each other and mingle. Finally, each team is given 15 minutes to set up prior to presenting its case to 3 judges and an audience of students and professional conference attendees. What's the value of this kind of competition? Prior to the competition, most of us knew nothing about P&T other than it meant "pharmacy and therapeutics." Competitions like this provide good learning experiences for students.The P&T competition exposed us to a whole different aspect of pharmacy and challenged us to practice our critical thinking skills. Pharmacy is not only about having the knowledge of drugs, but about understanding how drugs affect patients' lives. In the competition, we had to evaluate the clinical effectiveness of a new class of drugs for the treatment of a rare disease. On top of analyzing the clinical data, we also had to consider the potential financial impact of new drug therapies on a patient and the health system. These are things we don't necessarily learn in traditional classroom teaching. Through the P&T competition, we were able to apply evidence-based decision making and get a taste of pharmacoeconomics and how it factors into the final decision making. The presentation aspect of the competition only further emphasized the importance of effective communication skills for pharmacists. After all, pharmacists serve as important links between drug information and the other health care providers and patients. The P&T competition not only provides a learning experience about the P&T formulary process, it also is a great way to get exposure to the essence of managed care and meet pharmacists who are involved in that field.